Tonight, host Salman Khan will announce the name of the next contestant, who would go home from Bigg Boss 11. As readers would know, Shilpa Shinde, Vikas Gupta, Jyoti Kumari, Akash Dadlani, Luv Tyagi, Benafsha Soonawala and Sapna Chaudhary were nominated this week. In Saturday’s episode, Salman had already informed that Shilpa, Akash, Sapna and Vikas were save. 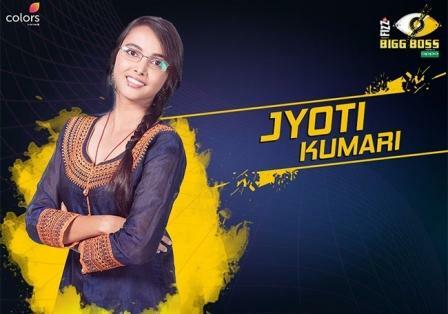 Now coming to the one going home, Bihari girl Jyoti will be seen getting evicted in tonight’s episode of the show. The 20-year-old young girl, daughter of a peon from a very small town entered the show with lots of dreams in her eyes. Though she showed quite a lot of spark in the initial episodes, she was overshadowed by the celebs over the days. Jyoti has been a constant support system to Vikas and stuck to his side like a younger sister. The girl got nominated owing to Mehjabi Siddiqui’s selfishness. The padosi in a bid to save herself nominated Jyoti as per the twist in the nomination task. Coming back to Jyoti’s belief in herself before she stepped in the house, in a chat with indianexpress.com she had said, “Housemates who will take me as a kid will be in for a shock. I am not someone who can be bullied. I will shot back if I feel that I am not given the due respect or being sidelined anyway. The Indian government says that at 18, a person is an adult, so they better treat me equally,” she quipped as she prepped up to get on the stage with host Salman Khan.